Put away the pencil, the tape measure, and even the level—there’s an easier way to hang a photo picture-perfect every time. Try this tip that makes the process so simple, anyone can get the "hang" of it! It’s no easy feat to master the art of hanging a picture on the wall. Between marking the hole, hammering the nail, and struggling to keep the frame level, what seems like it would be a straightforward task often turns out to be surprisingly tricky, sometimes even calling for the care and attention of two people at once. Believe it or not, you can simplify the process, dramatically so, with an inexpensive little tool you’ve never thought twice about before—a wooden paint stirrer. 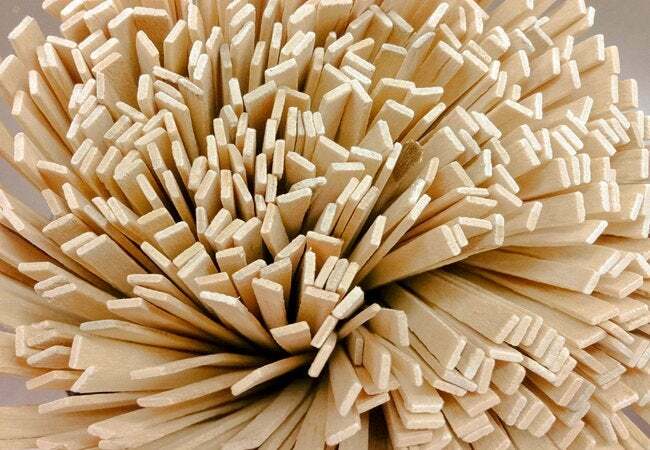 First, drive a nail halfway through the stirrer, one or two inches up from the bottom. Move on to the next step once you’ve set the nail so that, while its head sticks out on one side, its tip sticks out on the other. Now turn the frame over and locate the hanging hardware, be it a wire, metal ring, or sawtooth clip. Hook the hanging hardware over the protruding nail head and pick up the frame by means of the stirrer, being careful not to let the frame slide off. The frame should hang securely suspended from the nail, allowing you to place the stirrer against the wall in order to test different placements. In this way, you can easily move the frame a little to the right, up a bit, or down a smidge until you strike upon the look you want. Once you’ve determined precisely where to locate the frame, remove it from the nail head—without shifting the nail tip. Finally, press the paint stirrer against the wall until the nail tip pokes a little hole in the drywall. That indentation marks where you need to hammer the nail. Once you’ve done so, hook the hanging hardware over the nail again, and you’re all done. Bet you never pictured it could be so easy!